(Top) Andrew Borger (left), Director of Leighton Properties Queensland and Director of Green Building Council of Australia was the guest speaker at the Your Building Brisbane workshop. Also pictured are Andrew Carre from RMIT's Centre for Design and Lyn Pearson from Construction Innovation. 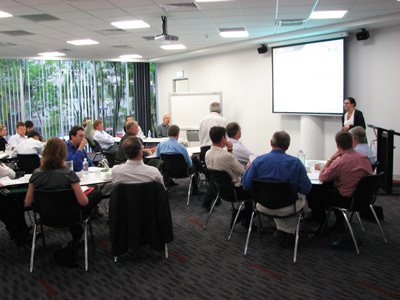 (Below) Participants at the Your Building workshop, Brisbane. 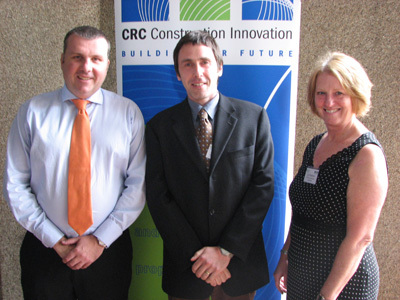 Construction Innovation has piloted a new training workshop on Developing a Business Case for Sustainable Commercial Buildings. The workshop, developed in association with the Australian Greenhouse Office (AGO) and the Australian Sustainable Built Environment Council (ASBEC), was run in Melbourne, Sydney and Brisbane in November. The workshop was developed from content from the Your Building web portal launched in September 2007. “There is a great demand from industry for relevant training in the sustainability area,” said Construction Innovation's CEO, Dr Keith Hampson. The pilot business case workshop focused on identifying business case drivers and value factors, justifying sustainable buildings in commercial terms, building a business case, influencing key decision-makers and employing practical sustainability tools, models and concepts. More than 70 participants have undertaken the pilot workshop and provided valuable feedback to shape future workshops. Feedback indicated a high level of interest for training in the sustainability area. The workshop content was delivered in collaboration with RMIT's Centre for Design and featured industry involvement by means of guest speakers from Stockland, Leighton Contractors and Szencorp. Dr Hampson �said it was hoped the courses could be run in additional cities in 2008. 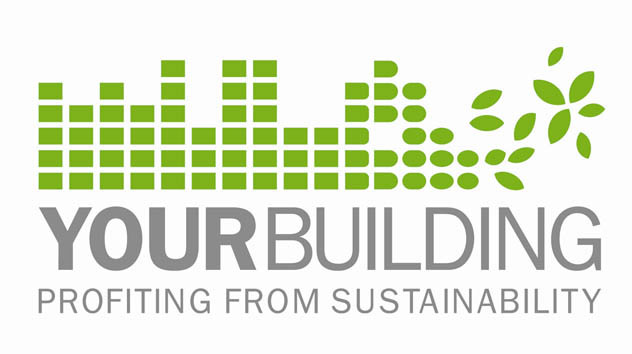 The Your Building training workshops have been developed as part of Construction Innovation's industry training activities for 2008, which also feature training in safety and relationship management.